For 2007, the Honda Civic adds an Si sedan version that shares its 197-horsepower engine, six-speed manual transmission, and four-wheel disc brake setup with the Si coupe model. Honda's engineers tweaked its suspension to compensate for the sedan's longer wheelbase. Front-seat passengers get the Si coupe's sport seats. Both Si editions come standard with an electronic stability program for added control in emergency maneuvers. The 2007 Honda Civic Sedan is powered by a base 1.8-liter Inline-4 with 140 hp. Other available engines include a 2.0-liter Inline-4 with 197 hp and a 1.8-liter Inline-4 natural gas with 113 hp. 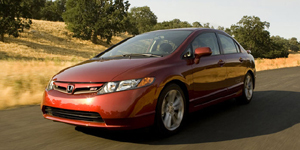 The 2007 Honda Civic Coupe is powered by a base 1.8-liter Inline-4 with 140 hp. Also available is a 2.0-liter Inline-4 with 197 hp. The 2007 Honda Civic Hybrid is powered by a 1.3-liter Inline-4 with 110 hp. Find the used Honda Civic of your choice from a dealer in your area. Search our used car listings now.